Expand your horizons on board the comfortable, state-of-the-art Viking Sea, intimate and thoughtfully created by experienced nautical architects and designers to enrich your interaction with your destination in every way. Experience nothing but elegance on board the Viking Sea with a wide selection of staterooms available, to meet the individual needs of passengers. All staterooms feature a veranda, ensuring you never miss an opoortunity to take in stunning ocean views. 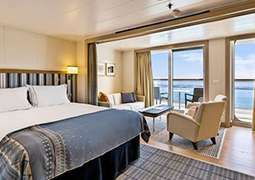 Staterooms range from the Veranda stateroom to the Explorer Suite. Regardless of the chosen category, each category offers comfortable and spacious cabins with necessary amenities required by guests. Enjoy Wi-Fi, 24-hour room service, movies-on-demand and much more as standard. The dining on board Viking Sea offers passengers maximum choice and variation. The 'Restaurant' offers exquisite themed food each night, changing in order to reflect the local cusine of the region, ensuring that passengers really enjoy a true taste of each destination 'Manfredi's Italian Restaurant' serves up a medley of Italian-style classics, leaving passengers spoilt for choice. The 'Pool Grill & Bar' is located right by the pool and is ideal fior casual dining while on-the-go. Viking's 'World Café' offers guests a refreshing selection of International dishes such as sushi, in addition to many American and European favourites. Basque in the casual dining atmosphere and enjoy dining al fresco style. Entertainment on board Viking Sea is an experience not to be missed. The main theatre shows various lectures, movies and also ted talk broadcasts. In the evening there are performances from singers and dancers and various themed shows. Those looking to spend the evening in more calm surroundings can take full advantage of the unique feature that is the 'Wintergarden', designed using Scandanavian design principles, guests can expect to find a space of ultimate peace. Guests can also enjoy a spot of Afternoon-tea complete with pastries served throughout the afternoon.There are two cinemas on board which show movies on a big screen most evenings. There are bars and lounges galore to choose from including the 'Explorers Lounge' with pianist performances and marble seating, where the atmosphere is sophisticated, while the 'Torshavn' is a more brighter loft-style space complete with exquisite decor while playing host to numerous cabaret shows. There are numerous enjoyable activities to take part in on board. There is Trivia on board for those competitive passengers and those looking for some old-fashioned entertainment can find a wide selection of board games on board. Why not enjoy a day by the pool, followed by some relaxation time in the hot tub? Each port that Viking Sea stops at will have a shore excursion where local guides who speak English can provide passengers with some enlightenment on the history, culture and heritage of the port. One of the highlights on the cruise is in the Spa, where you can experience a luxury spa treatment or just enjoy an afternoon in the thermal suite. Fall in love with the snow grotto the main attraction of the spa. Keep your heart racing in the fitness center on board or participate at one of the classes available. Passengers who enjoy a run with a view can benefit from the jogging track located on the 360° Promenade on deck 2 which wraps around the entire ship.